Enjoy this comfortably equipped classic Kiwi Bach which was, in a previous incarnation, the old schoolhouse. Well appointed and set privately off the road, you can enjoy views overlooking Russell, Paihia and Waitangi along with fabulous sunsets from the verandah. The large front lawn is ideal for sunbathing, dining or to play cricket, croquet or frisbee on. It is also frequented by a family of wekas who will happily accept any pieces of spare bread you leave there.. Safe and attractive Long Beach is a 3 minute walk away. There are many local walking tracks and beaches to explore and historical sites to visit. Head down to the Russell waterfront and wharf for cafes and any fishing or tour bookings you might like to make. Guests to clean and leave property as found. Cute cottage in private setting. Well setup. Great views. Easy walk to best beach. Simple cottage but had all week required. Great view and location. Great cosy place to stay in. It is in a great location to everything, only a 5 minutes walk to Long Beach and a 15 minute walk to the town centre. It has everything you need. Would highly recommend. Beautiful spot and delightful, comfortable cottage. Beautiful spot and delightful, comfortable cottage. We loved staying here. Great location - sheltered, private, quiet with amazing views and only 5 minutes walk to beach. Great location - sheltered, private, quiet with amazing views and only 5 minutes walk to beach. Quaint cottage with all the amenities, it was clean and comfortable. Grateful we could take our dog. Fantastic guests left the cottage in top condition. great you enjoyed our quaint little cottage. Crew cottage is the quintessential kiwi Bach in the best location, with all the mod cons. 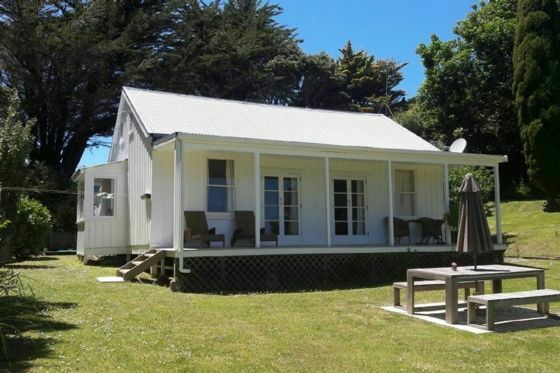 Crew cottage is the quintessential kiwi Bach in the best location, with all the mod cons. We will be back!